Foreigners familiar with the name "Achille Lauro" generally know it as the name of an ill-fated ship. The keel was laid in 1939 in the Netherlands, but the ship was not launched until 1947. The original name was the Willem Ruys; she was sold to the Lauro line in 1964, and the name was changed to the Achille Lauro.Then came the notorious hijacking by the Palestinian Liberation Organization in October of 1985. Subsequently, the passenger liner continued in service until 1994 when she caught fire off the coast of Somalia, was abandoned, and sank. Lauro was born in 1887 in the town of Piano di Sorrento. He attended a civilian maritime school and inherited a first small coasting vessel in 1912. By the outbreak of the Great War he had a small merchant fleet, the ships of which were requisitioned by the state for the war effort. He started anew and by 1933 had a fleet of 21 ships. He joined the Fascist party in 1933. At the beginning of WW II he put his considerable merchant fleet of 57 ships at the disposal of the Italian war effort. During the war he acquired 50% share in a number of Neapolitan daily newspapers. He was arrested by the Allies in 1943 and spent 22 months in jail. By the end of the war his fleet had been reduced to five ships. He was not found guilty of criminal activity and was released from prison. In 1949 he went into the true passenger business with the acquisition of a liner from the American Grace Lines, renaming the ship Surriento, the dialect spelling of "Sorrento." During the 1950s he rebuilt his fleet to 50 ships. 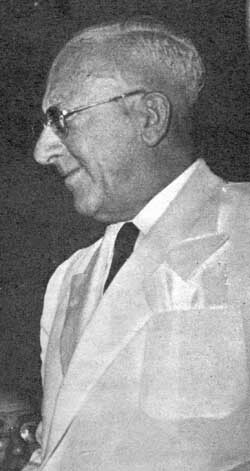 In the building frenzy of the 1950s, Lauro was responsible for many of the 80,000 new dwellings built in Naples, the construction of the San Paolo football stadium in Fuori Grotta and a new train station at Piazza Garibaldi. In 1973 Lauro went into the oil tanker business with the purchase of two supertankers, the Coraggio and the Volere. In 1976, at the age of 89, he founded Canale 21 in Naples, the first private TV station in Europe. He lost his last electoral campaign in 1979. In 1981 financial troubles beset his empire. He died in 1982. After his death his fleet was broken up and sold. It is hard to get a neutral opinion on Lauro. Like all self-made millionaires, he was ambitious and knew how to get things done. He was mayor at a time when the city was still recovering from the considerable urban devastation of WW2. The port and industrial plant of the city were ruined, and the population was over a million and climbing. His critics accused him of being a qualunquista —an Anythingarian— with a too pragmatic, "whatever-works" approach to urban problems, one that led to rampant overbuilding and corruption. His defenders claim that he did what he had to do to revive the city. Me? I just live here.